$3.67 for the first item and $0.67 for each additional item. US only. Ships no later than Tue, May 2. 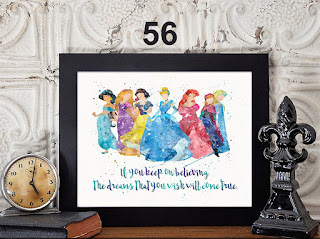 11x14: Larger sizes of our beloved enchanted quotes & characters watercolor prints. Dreamy new inspirational & favorite artworks to create your own enchanted kingdom. Beloved characters with uplifting quotes to inspire your lovelies in so many positive ways! Our statement sized collection of character inspired art and typography is done in an impressionistic & splatter watercolor style. The larger sizes are perfect to add to your already existing collection. Please Note: This is a handmade item done item. Watercolor has a magic all its own and the prints will show intended variations in color, tones, grains and textures. They are less cartoon and perfect for all ages! Frames are not included but are examples of how versatile and great they frame up. You can further customize your own artworks with frames that reflect your own personal style. This is a hand made item and they are artistic expressions. Imperfections in grain, variations in texture & tones are the usual & desired effects in hand done and watercolor artworks. The background is an light white. I make each print to your order. Prints are professionally printed on substantial weight archival art papers. The printing technique uses rich & lasting archival pigments for superior color and clarity that's true to the original art. The paper size is 11x14 with no trimming needed for an 11x14 standard frame. Please measure prior to ordering, as some images are shown smaller than 11x14 size they will arrive at. Thanks! Images shown are digital versions of the artworks and due to color restrictions of digital devices or monitor settings, it is normal that colors may appear slightly different than those on the high quality printed product. The prints also will come without frames. Please Note: Prints are rolled & mailed in a heavy art box for safest non-bending shipping.